Located in the city center, 200m from the beach this beautiful villa recently renovated combine class and comfort and is surrounded by 300m² of landscaped garden. 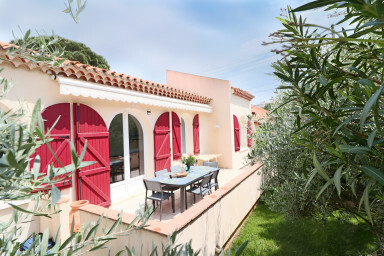 Ideally located in a quiet street of "la Pinede" the city center of Juan les pins, this wonderful villa is surrounded by a lovely garden with a nice Jacuzzi, and has a nice terrace with a dining table up to 8 people and a Weber barbecue. The house is very well conceived and allow all of the comfort necessary for a perfect stay. A spacious dining room for 8 guests, a fully equipped open kitchen, a master bedroom with it's own private one suite bathroom, a seconde bedroom, a large bathroom with both shower and bath as well as an independent studio with it's shower. You will also have an office room that could be used as an other bed if needed. Bathe in the effervescent glow of the glittering coast line and treat yourself with local delicacies and fresh caught fish in one of our renowned beach restaurants. By foot, enjoy the many charms of Juan-Les-Pins : Its fine sand beaches, designer shops, bars and restaurants. This seaside resort is the meeting point of the French Riviera and the place of creation of the very popular water sport during summer season : Water ski ! • Concierge services available 24/7 to meet all your requirements (Boat charter, bike rental or scooter, last-minute booking in one of the best restaurants in the city, places of choice for a show...) so that your stay on the Côte d'Azur will be as memorable as possible. • We can organize the disposal of a vehicle with driver or arrange a simple transfer on the clients request. Number 1 direction Antibes Center. Number 200 direction Nice or Cannes. This ad is offered by an individual.